Viewers who thought last week’s episode was too light on action won’t be able to make the same complaint after “To’hajiilee.” You know there’s a good chance the fit will hit the shan when the credits list Michelle MacLaren as director. She’s the person responsible for some of the series’ most memorable action sequences, including the prison massacre in “Gliding Over All” and Hank’s shootout with the Cousins in “One Minute.” This was her final episode behind the camera, and she went out with a bang. Or rather, several bangs. The first half of this episode picked up where the previous one left off, with Todd getting the call from Walt. He’s still the most polite criminal you’ll ever meet, a perfect gentleman content to be used by the people around him. He’s like Jesse but without a backbone, willing to do anything for the authority figures in his life. It’s that weakness that makes him so creepy, and potentially dangerous; his only personality trait is one of submission. In this episode, we find out he has a crush on Lydia. Somehow, I don’t think the feeling is mutual. Hiring Uncle Jack to take out Jesse may turn out to be Walt’s biggest mistake. Jack hasn’t felt like much of a formidable antagonist, especially compared to the likes of Gus Fring, but showrunner Vince Gilligan has turned that to the show’s advantage. Fring imbued the series with a sense of omnipresent oppressive dread; he was a quasi-mythical force that seemed impossible to beat. Jack and his gang, meanwhile, are far more ordinary, just a bunch of scummy neo-Nazis looking to get rich. In a strange way, this makes them even more dangerous. Fring was a meticulous professional—he had a way of doing things. Jack does whatever he feels like will help him out in the short term. Whereas Fring was the embodiment of order, Jack is chaos incarnate. He’s like a more threatening version of Tuco, a cold-hearted killer who actually seems to be sane. When Walt shakes his hand, he may have unknowingly just signed his own death certificate. For a few seasons now, one of the running motifs of Breaking Bad has been how Walt takes on the traits of the people he kills. After he killed Crazy Eight, he started cutting the crust off his sandwiches. After he killed Gus Fring, he inherited his bathroom etiquette. In “To’hajiilee” it’s revealed that Walt now has Hector Salamanca’s distrust of the DEA. He deluded himself into assuming Jesse felt the same way, that no matter what happened, cooperating with Hank was out of the question. When he calls Jesse a coward, he means it. Walt has always acted out of desperate cowardice as much as bravery, but he’s grown to view himself as an old-school gangster. In Walt’s game, using a child as bait to manipulate other people is an acceptable move, but working with the cops is dishonorable. 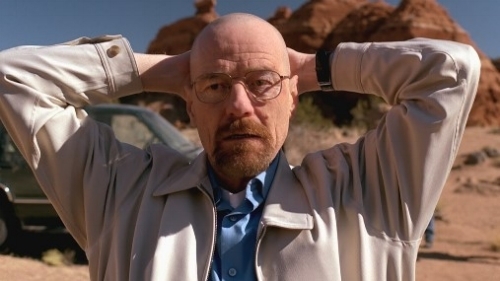 As a side note: Like Fring, Walt’s weakness is what got him into the meth business to begin with. Fring spent decades building up his empire so he could eventually seek revenge on Hector Salamanca and the cartel, and it was the panic at the thought Hector might have beat him that ultimately destroyed him. Walt started cooking meth to make money for his family, and once that’s threatened, he races straight to his undoing. Gus’ assumption that Hector might cooperate with the DEA was his downfall, and Walt’s assumption that Jesse never would is his. Jesse finally did “apply himself” after all and learn what Walt was teaching. Their final meeting in the desert is one of cathartic relief. The look of awe on Jesse’s face speaks volumes: he can barely believe what he’s seeing. This is what we’ve been waiting for, to see the Devil himself finally in handcuffs. Cranston knocks it out of the park here, going from anger to fear to confusion to resignation in a matter of seconds. He could easily take that final step to the dark side and call in Jack to kill Hank—after all, it was just one episode ago he referred to Jesse as family, and look how that turned out—but, in a weird way, he still has a sense of honor. He knows that Jesse beat him at his own game, and he’s willing to accept defeat. This makes the arrival of Jack even more tragic. Walt has finally reached a line he won’t cross, but he’s made a deal with someone who will cross it for him. And yet, I’ll be surprised if Hank dies in this shootout. We’re used to seeing major characters get killed off right at their moment of triumph (especially after making one last heartfelt phone call to their loved ones), and if there’s anything Breaking Bad has shown us, it’s to expect the unexpected. Jesse even said as much last week: “Whatever you think is going to happen, the exact reverse opposite of that is gonna happen.” Who knows, maybe Walt is even so committed to keeping family safe that he’ll even put his own life on the line to rescue Hank and Jesse. If these are Hank’s last moments, it’s a satisfying death, but I hope he took a cue from Saul and decided to wear some extra protection. He’s survived shootouts like this before, but has his luck finally run out?